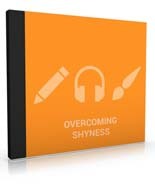 There are 10 audio parts in this pack talking about overcoming shyness! Audio #3 Am I Shy or Just an Introvert? Audio #6 Highly Sensitive Person or Shy?